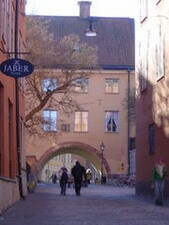 Uppsala is the fourth largest city of Sweden, located about 70 km north of Stockholm. Uppsala is the seat of Uppsala municipality (Uppsala kommun), capital of Uppsala County (Uppsala län), and Sweden's ecclesiastical centre, being the seat of Sweden's archbishop since 1164. Uppsala is famous for its university, the oldest still existing in Scandinavia and Northern Europe, founded in 1477. The train from Stockholm takes 35-40 minutes and from Arlanda airport 25 minutes. You can also take Bus 801 from Arlanda Airport (SEK 90) which will take you to Uppsala central station in about 40 minutes. Opened in 1982, the First Hotel Linne is housed in a contemporary five-storey building located next to the Linnaeus Garden in the centre of the Swedish city of Uppsala. The railway station is 500 metres from the hotel. 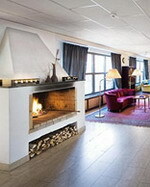 The hotel, which is a smoke-free property, serves a buffet breakfast each morning and offers a sauna for relaxation. Active guests benefit from discounted access to a local fitness centre. The Elephant Bar serves a wide range of drinks, accompanied by a bar menu, in an Oriental-style setting, and offers al fresco dining during summer. Open from Monday to Saturday, the Orange Bar & Restaurant serves Caribbean specialities in a minimalist dining room. The Linnaeus Garden is a reconstruction of the Uppsala University Botanical Garden as it was when Carolus Linnaeus, one of history's foremost botanists, was in charge during the 18th century. The 13th-century Uppsala Cathedral is 200 metres from the hotel and the Fyris River is 400 metres away. 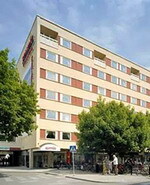 The five-story Hotel Uppsala stands in central downtown Uppsala, Sweden. This cream-colored structure is located 350 metres from Linneaus Garden and 600 metres from Uppsala Cathedral. Vasa Fortress and Uppsala Castle are 800 metres from the property. Three kilometres from the hotel are the Viking Mounds and Old Uppsala. Offering a selection of dishes, beers, and whiskies, the Hotel Uppsala features a Scottish-style pub and restaurant. Drinks are also served in the lobby bar. A complimentary breakfast is served daily. Business services include wireless high-speed Internet and a meeting room for 35 people. The Hotel Uppsala is next to the Linneaus Garden. This expansive park is Sweden's first botanical garden and home to over 1,300 species of vegetation. 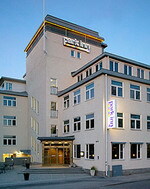 The Park Inn Uppsala is located in Uppsala, Sweden, adjacent to the central train station, 200 metres from the city centre and 800 metres from Uppsala Cathedral. 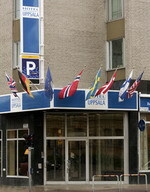 The 4-storey Park Inn Uppsala (accessible by lift) is located in the old Crafts Guild building, built in 1950. Amenities include a restaurant, bar, sauna and steam room. Massage and spa services are available from the onsite Uppsala Lilla Spa. Guests are entitled to discounted rates at a nearby fitness centre and garage parking is available (surcharge). Traditional Swedish dishes are offered for lunch and dinner at the hotel restaurant, situated near the lobby. Vegetarian and children's menus are also available. Bicycles can be hired from the hotel and are an ideal way to explore the city. Other recreational activities on offer in the vicinity include golf, swimming and tennis. Every Saturday during the summer, there is a busy flea market held at Vaksala Square. Trading starts at six in the morning, so go early to find the good stuff. The Scandic Uppsala Uplandia is a modern hotel centrally-located in Uppsala, within one kilometre of attractions such as the Cathedral, the Castle and Linneaus Garden. Guests enjoy access to the hotel's sauna and relaxation area free of charge; more energetic guests can work out in the fitness room. Covered parking is provided for a surcharge. Guests can dine at the 300° Bar & Grill, a smart, contemporary restaurant serving international dishes alongside a selection of wines; drinks and light meals are also served in the informal lobby bar. Complimentary wireless Internet is available throughout the hotel, and guests can ask staff at the front desk for tips on local sightseeing hotspots. Nearby attractions include Uppsala Cathedral, 500 metres from the hotel, and the University Library, the oldest and largest library in Sweden, two kilometres way. Stockholm-Arlanda Airport (ARN) is 32 kilometres from the hotel, around 30 minutes by car.